Place onion, garlic and tomatoes under the broiler, or on an already heated skillet, griddle or comal set over medium heat. Roast or char for about 10 minutes, flipping in between, until ingredients are completely charred, cooked and mushy. Set aside and peel the garlic cloves when cool enough to handle. In a small skillet set over medium heat, toast the cloves, peppercorns and cinnamon stick for a couple minutes, moving and flipping them around to toast evenly. Set aside. Toast the oregano for 10 to 15 seconds and remove from the heat. In the jar of a blender, place the charred onion, peeled garlic and charred tomatoes, along with the tops from the whole cloves (discard the stems), the peppercorns, cinnamon and oregano. Puree until completely smooth. Heat the oil in a large casserole set over medium-high heat until very hot, but not smoking. Season the chicken with the salt and brown the chicken pieces for 2 to 3 minutes per side. You may need to do this in batches in order to not to crowd the casserole. Once you have removed all the chicken, immediately pour the tomato sauce into the hot oil and cover, as it will splatter. Reduce heat to medium. Add a cup of chicken broth to the blender and puree for a few seconds to get all the remaining thick sauce out of the blender, pour into the simmering sauce and cover again. Cook for 10 minutes, stirring occasionally. 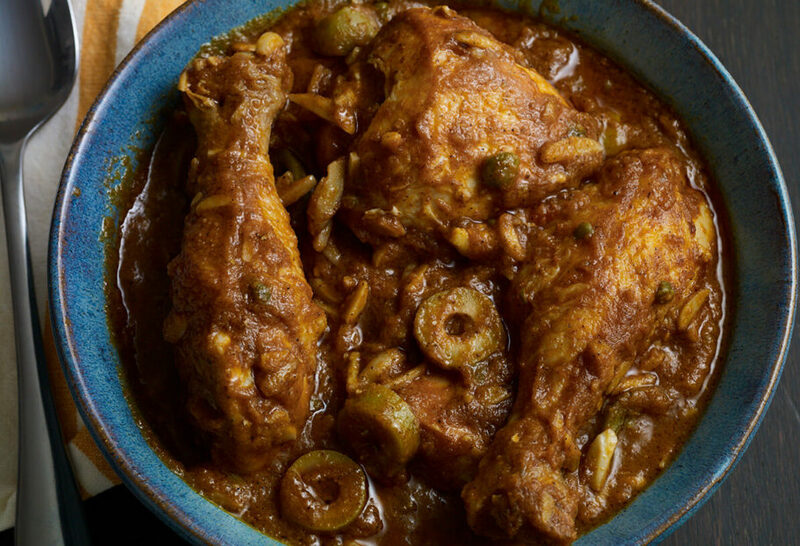 Incorporate the remaining cup of chicken broth, almonds, raisins, olives and capers. Add the browned chicken pieces, cover and reduce heat to low and cook for 20 more minutes. Remove the lid and add the pickled jalapeño slices. Increase heat to medium and cook for another 10 minutes, allowing all the flavors to blend and the sauce to thicken. Serve with rice. Muy delicioso. Mi esposo se comio casi toda la cacerola.. Lo voy hacer nuevamente. Me llevo mas tiempo en cocinarlo. De lo que lo saborie.!! Gracias paty por tus deliciosas recetas.! Esta es la primera receta tuya que yo hago y que crees? Me encanto. No conozco Oaxaca pero gracias a ti ya probé una de sus delicias..
Our first ‘Pati Dish’ (of many to come) and we’re SOOOOO happy! Wild about the rich smoky notes from the charred veg and the sweet and salty hits from the raisins and olives/jalapenos/capers. We’re super-excited to have found a wonderful Latin tienda not far away, and are now the proud owners of a new comal and a pantry-full of ingredients. !Muchas gracias por ensenarnos, Pati! Oh wow! Thank you so much Sandy and Tom. I hope you have lots more fun cooking up my recipes with your new comal and Mexican pantry. Hola Pati,gracias por compartir deliciosas recetas.Feliz Navidad. Mil gracias, Carlota! Feliz Navidad! Delicious my friend! We thoroughly enjoyed it! Thanks for a great recipe. Thank!!!! !, is so delicious. I try this Sunday dinner. Have a great Sunday dinner, Raquel! I saw your show for the first time today. This recipe reminds me of my Mom’s recipe that is a family favorite that I call “Mexican Chicken”. Key ingredients are the holy trinity of celery, bell pepper and onion cooked til caramelized then add whole canned tomatoes with camino, salt and pepper which is combined with browned chicken. Feel better soon Lea…and I hope you and your mom enjoy the chicken! Pati,, Pati, Pati ! All I had to do was read the ingredients then said I want to try this. I did last night. So good. Though it was warm outside everyone agreed this is a great fall-winter dish. So rich in flavors with balance. We can taste everything on the list. I will share this with friends and I know they will love it too. It is a Mexican Caccitore. Everyone here loved it. Thank you for another outstanding recipe. I might even have it for breakfast this morning. I’m thrilled to hear that Carl…thank you so much! Sge also does a turkey dish in a similar way (green olives and all). I will try to post a recipe soon…. We made this for dinner tonite and my family loved it. The aroma of toasting the cinnamon and cloves was amazing. The unique combination of ingredients are a perfect match. So glad your whole family loved it, Jennifer! Wow !!! The this dish is delicious ‘!!! Hope to one day visit this beautiful town. I hope you get to go soon too, Pat! So glad you liked the dish! It looks delicious but I would like to see more recipes that are faster and easier to make than so many ingredients. Thank you for the suggestion Sidney. I’ll try to post some more soon. this sounds delicious and I don’t see much sugar in the recipe other than the raisins, I will try it in the near future, its not your typical mole sounds like, thank you. Thank you, muchas gracias, merci beaucoup and danke schön for the recipe!!!!! I first had pollo almendrado in Oaxaca years ago at a restaurant called La Casa de la Abuela. To this day it remains my favorite dish of all time. But we never see it on restaurant menus where I live (Chicago area) so I’m looking forward to trying your version (which I’m sure will be every bit as good). Thank you for sharing! And I hope you enjoy it! Sounds delicious, but then, all your recipes are! I had this chicken years ago when I was in Oaxaca for work, but had forgotten about it. Thanks for the recipe! Oh I hope you enjoy it as much as you did years ago!